1000 miles done – and then a slump. At some point last week I smashed through the 1000 miles for the year barrier. I don’t quite know when, as our laptop broke a few weeks ago and I hadn’t been able to upload my Garmin stats. I actually thought I was still a good 30 miles off it, but yesterday after the new laptop was unpacked and my Garmin was linked up again, I got the grand total to date – 1013 miles with 37 days of the year still to go. Hoorah! Doesn’t get more beautiful that this – but where has my running mojo gone? 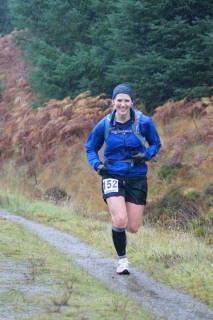 A few weeks ago, I took a trip North with Jemma, who is running her first Ultra (The Tigh Nam Bodach 50k) this Saturday. The race starts at the Loch Lyon Dam, follows a loop around the Loch before heading down through the hills, through some rivers (??! ), back up the hill and back to the Dam. With the thought of beautiful scenery and free Merino wool socks from the sock station at the half way point – Jemma was persuaded. We went up one weekend to recce the second part of the course as she wasn’t quite sure what to expect underfoot. We got there after a good few hours of windy single track roads and Skye, my border collie, and I staggered out the back of the car to try and shake off our motion sickness. Once our legs were ready to go and we had eventually figured out which way to go (note: there is no phone reception up here and GPS struggled a bit!) and set off on the single track road for a few miles of ups and downs. Before long we were turning off the road and following a muddy path along the side of a mountain. The path was quite firm under foot for the first mile or so but it got wetter and muddier the further along we went. So after a few miles we decided to turn back as we’d got a fairly good idea of what the course consisted of. Plus it had taken us that long to get over, I was worried that it was going to get dark before we were off those horrible single track roads! Jemma and Skye in the snowy hills. Beautiful yet cold! Good luck to everyone running the race this weekend. I’m sure it’ll be beautiful and an awesome experience. I, however, am still struggling to get out of my post Ultra slump and most of my November miles since the race have felt like a chore. I’ve still managed to get out quite a bit, and club training is always awesome but I just don’t seem to be enjoying my longer runs as much just now. I’m hoping it’s just the lack of sunlight and that I always seem to be running in the dark, or chasing the sunlight, but I feel like my running mojo has definitely gone into hiding for a while. However, I most certainly have the club to thank for helping me get all those miles in, making me want to run in the rain and enjoy it and being able to run for more miles without stopping that I ever thought possible! I guess it can only get better and next year is another year full of challenges. My first cross county event in about 15 years in a torrential downpour. Why not! So yeah… this bunch have a lot to answer for!! 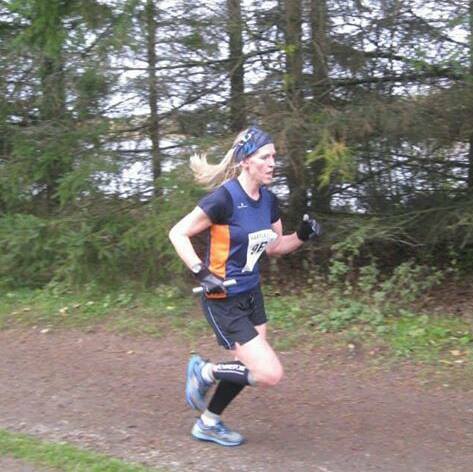 The Hartley Cup is an event held annually by small(ish) running clubs around Scotland and is made up of relay teams of 5 or 6 people – either male, female or mixed teams. 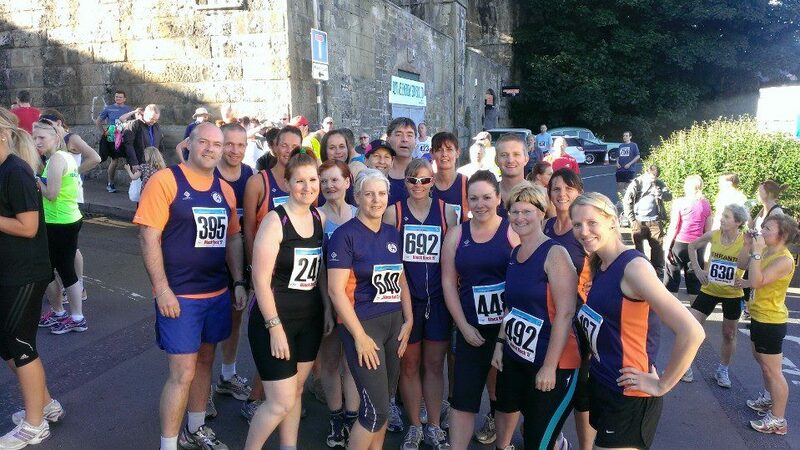 Each year a different club get the chance to host the event and this year it was the turn of the Forfar Road Runners. I arrived in Forfar with plenty of time to spare and made my way to Strathmore Rugby Club to meet up with my running club buddies. 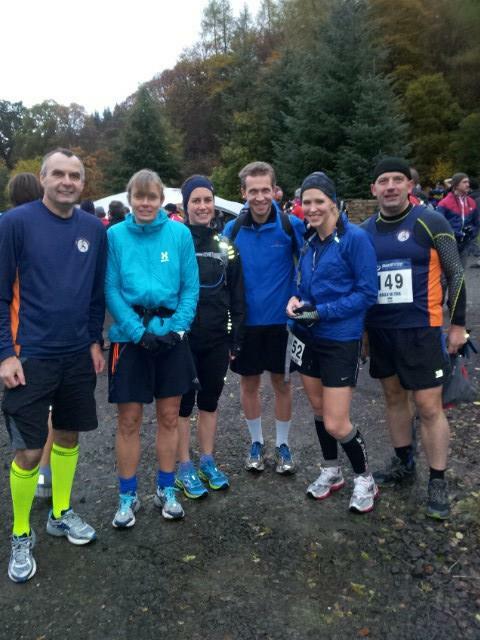 We had a good 20 strong team for the event, consisting of three mixed teams and a ladies team. There was a bit of hanging about outside while final decisions on teams were made and I found myself on a team with the super, super speedy runners so the pressure was well and truly on. Between marathon/ultra training and swanning off to America for weeks, my speed work has been pretty non-existent since about May this year. I tried to keep a calm exterior, but underneath I felt like jelly – could I pull some fast out the bag for a couple of mile loops? Well, I’d try my hardest! Come on little legs…Go faster!!!! Concentrating on not dropping that baton!! Graeme went off like the wind and flew back in just over 8 minutes to pass the baton on to Eilidh. She also had a speedy lap of just over 9 minutes and then it was onto coach Gordon to finish the first leg with speed – which of course he did! Now we just had to do it all over again! Round 2 was just as fast with John once again flying off and me anxiously watching the clock waiting for him to fly back round what felt like seconds later! The second lap wasn’t as bad (which means I could have gone faster) and I managed to overtake a few people this time round, which gave me the little boost I needed to dig deep and keep going strong. After passing the baton on for the second time I went to try and warm up by putting on as many layers as I could and then stood on the finish line to shout in all of our club teams. Oh, and Karen made this chocolate Guinness cake. It was glorious! Wasn’t expecting a medal, so am very chuffed with this beauty! Yesterday I became an ultra runner. At 4:50am my alarm went off and I got up after a very broken nights sleep. Once again my mind had been racing right up until I fell into a running filled dream – mostly dreaming I had forgotten something very important for the race! I forced down breakfast, had a shower, double and triple checked my drop bags and then paced around the house waiting for Kirsty to pick me up at 6am. My drop bags had been a big source of worry for me as this was the first race I had taken part in where I needed them. I had read plenty of blogs where runners have taken various means of fuel from bananas and crisps to full on meals of wraps and cups of tea! I decided to stick with things I thought would go down easily enough on the run and this is what I came up with…. 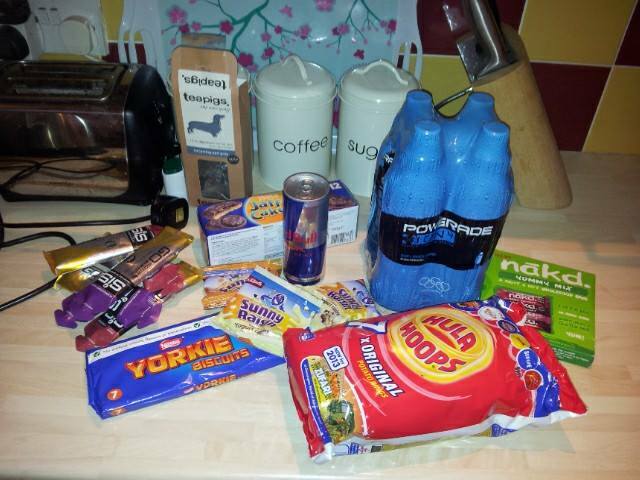 Various means of getting the calories back in. None of which really to appealed to me on the day! 6am came and Kirsty arrived with Andy and we began our 50 minute or so journey up to Strathyre. As the sun came up, we had various thoughts about the weather. The sky was bright but it was very cold and there was a low lying mist over the hills and fields. I thought it looked too nice to be true and then I started to worry about my choice of kit. I’m not a big fan of running in trousers so chose to wear shorts and calf sleeves. I knew that even though we’d be running for hours, it probably wouldn’t be at too fast a pace, so I thought layers were better to begin with and that I could lose them at check points if need be. So I decided to wear a t shirt under a long sleeved top with my club vest on top and then have my jacket attached to my bag, just in case it might rain (hah!) and then also my buff and gloves. Surely that lot would keep me warm enough?! We arrived in Strathyre not long after 7am, met up with the rest of our friends from the club who were also running, registered, sorted out drop bags and went back and forth to the toilets for the next wee while. We were all summoned at about 7.50am for a pre-race briefing by Bill and Mike and then we walked en-masse across the main road to the starting point and the bottom of the trail. This was it. Definitely no turning back or pulling out now. I was about to venture past racing distances of 26.2 miles for the first time. I was about to become an ultra runner. Kirsty and Catriona. Clearly ready to battle whatever this course throws at them. Before I knew it we were on our way. I had been too busy talking I hadn’t heard the race start! The first few miles go straight up a hill. I knew I’d have to pull back as I have a bad habit of setting off far too fast and burning out early, so we decided to stick to 10 minute miles for the first while and see how we got on. Before I knew it we had clocked up 2 miles and the first set of hills were over. I’d been concentrating so hard on what was going on around me and spotting various faces of bloggers/awesome ultra runners that I hadn’t been paying attention to my mileage. There was an awesome downhill section through the forest that went on for about 3 miles and we were again concious of pulling back and keeping our mile splits fairly even. We flew by the first drop point, not needing to pick anything up and I made sure I had a gel and a good amount of fluids as we plodded along the cycle track that runs alongside the main road down to Lochearnhead. Since the last time we had run this route, a lot of pine needles had fallen and the track was lovely and springy under foot. Just what we needed with so many miles still to cover and all the tarmac at the end! 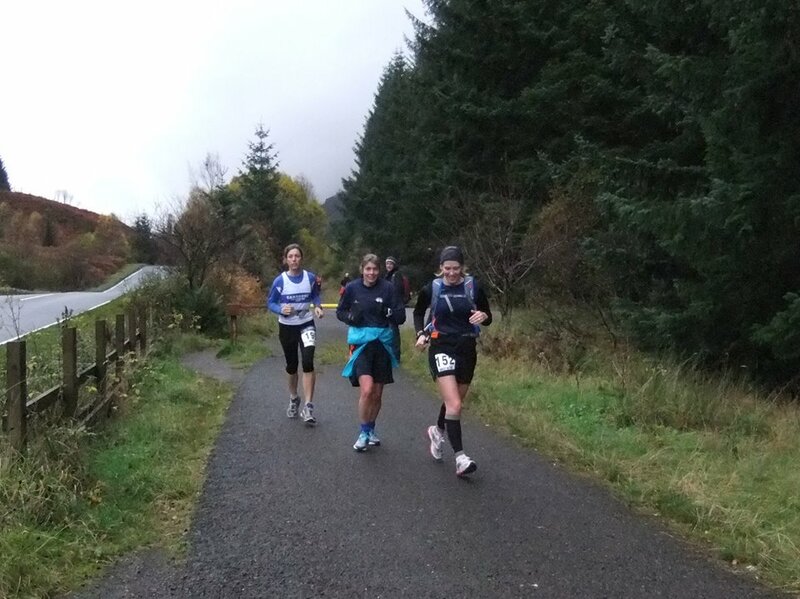 As we left Lochearnhead, the path took a very steep incline and Kirsty and I decided to power shuffle up it instead of running and Andy, looking strong powered on up it ahead. These zig-zags were steep and again I thought I didn’t want to burn out, so I held back until we reached the top of the hill and then it was a nice steady plod along the old railway which runs alongside the A85 and over the Glen Ogle viaduct. 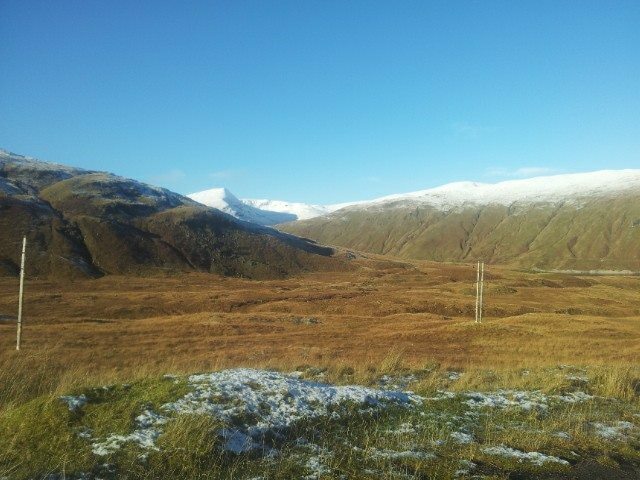 I had seen this countless time from the road when travelling north to tackle Munros, but running over it was a whole new experience! We stopped in the check point just to empty rubbish out our pockets and take another gel while standing still and after a minute or so we were on our way again, heading up to the forest loop. My club mates and I ran this loop last week just to see what it was like… but we ran it the wrong way around and so what we thought we the awesome downhill sections were actually the most horrific inclines. See elevation below – the big hill in the middle section was in the forest and yes, it was as tough as it looks! Tough on weary legs that have already run 15 miles! Once at the top we got our speed back up and enjoyed an undulating run through the top of the forest and through the eerie mist that was lingering around the trees. With the light dimming it looked pretty spectacular, but of course the light dimming could only mean one thing. The rain was on its way. Just as we came to the end of the forest trail we took the educated decision to get our jackets on, really just in time for the heavy, heavy rain to begin. This picture was taken just at the end of the forest and I think just before the photographer had to give up to protect his camera from drowning! Favourite picture of me running to date. 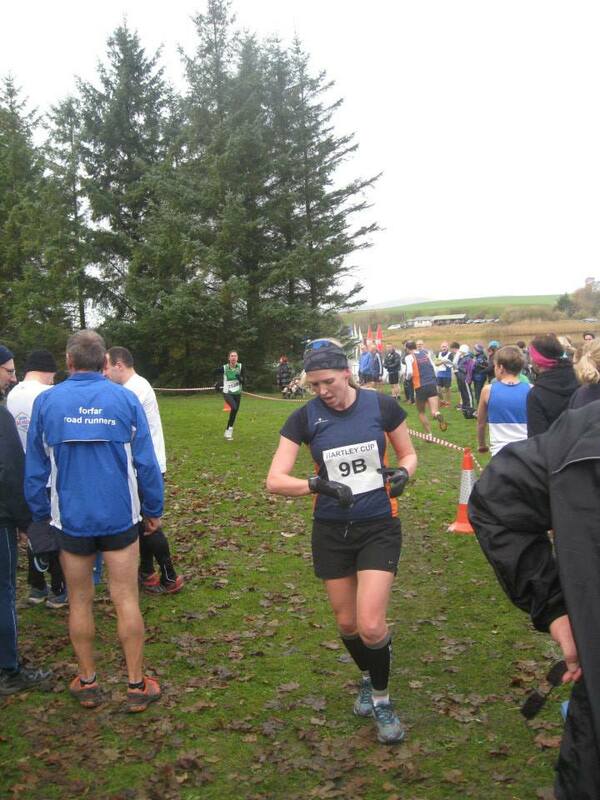 Cold, wet, tired and sore… but ready to take on the next section! We came back out the forest and decided to stop properly at the check point to refill our bottles, get fluids in and try to eat something substantial. The rain had really come on hard and we were already starting to feel the cold, which really wasn’t great with so many miles still to cover. After a few minutes we were kindly prompted to get moving, so with crisps in hand and jackets zipped right up, we were off on the return section of our adventure. 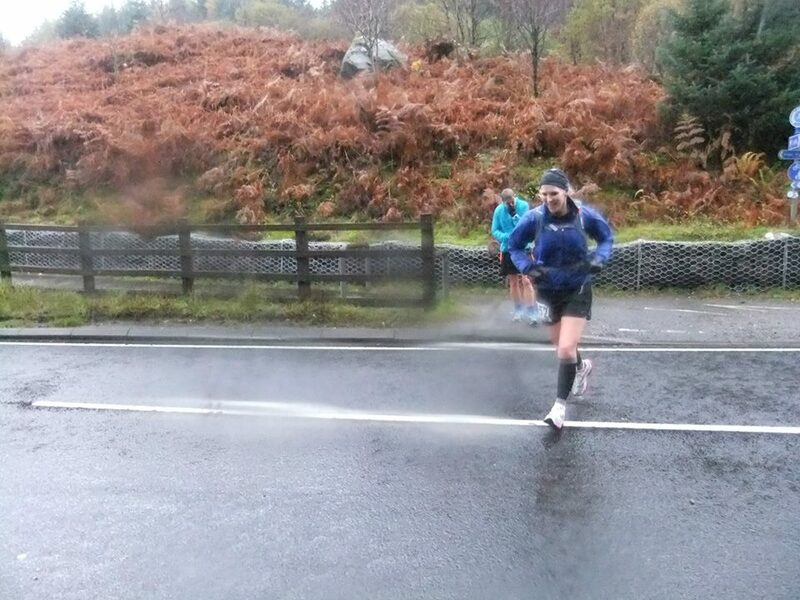 The return leg down the Glen was when the rain really came on heavy. Luckily once we were over the viaduct we were protected slightly from the wind by trees, but nothing could stop the driving rain. My gloves were soaked through and my jacket was sticking to my skin. My buff was stuck to my head and my thighs and bum were numb with the cold. My trainers squelched and my eyes stung with the rain, but still we battled on along the track, agreeing we would walk the hills and save something for the last loop around Balquhidder, remembering how tough and hilly it had been a few weeks ago when it had been dry. If I hadn’t been so cold and wet, I would have loved this part of the race as here I was, 22 miles in and still running strong after all those hills. Something I couldn’t have even imagined doing not even a year ago! We knew the next and final check point wasn’t far ahead and the thought of a couple of jaffa cakes and some powerade pushed me on down the soggy, waterlogged path. Once again the check points were manned by lovely, upbeat people who were standing in the pouring rain getting soaked, just to help us out and cheer us on. I found my bag and hoovered up a couple of jaffa cakes and the remains of a bag of hula hoops, washed down with half a bottle of undiluted powerade (which is what I had been running with in my camelbak – I still to this day have to find an electrolyte drink that doesn’t make me feel sick after 10 or so miles!) and then with the words “it’s only 5 and a half miles to go!” ringing in my ears, we were off on the final leg. This is where I really struggled and I was very, very glad I had my team mate Kirsty with me. I got so cold my top lip was that numb I felt like I’d been at the dentist! My legs wanted me to stop, my hands were stinging with cold as my Raynaud’s kicked in and I could have cried had my face not been so numb, but Kirsty kept me upbeat, reminding me we could see the finish in the distance and that we’d run it before so knew what to expect. We powered through puddles as there was no other way round and also we physically couldn’t get any wetter, and got our speed back up a little as the road evened out for a short while. The last mile or so is again nearly all up hill, so we walked while trying to keep warm and our spirits up, saving our legs for the last half a mile or so and of course the shoogly bridge. When we came back into the village and saw the sign pointing to the bridge we suddenly gained speed from an unknown place and galloped across the bridge to the finish line together. Totally soaked, physically shaking so hard from the cold and partially numb, it took me a good while to realise we’d finished! I had just run an Ultra marathon! Goody bag in hand I was carefully pushed in the direction of a gazebo where they were making cups of tea and coffee. I have never drank black tea in my life, but it was the tastiest most delicious drink I have ever had and was that appreciated I just couldn’t stop grinning at the poor confused lady who had made it for me, as I just held it and sheltered from the rain. It had taken me slightly longer than I had originally planned but taking the weather into consideration, I physically could not have done any more or gone any faster. I think a lot of people struggled due to the weather and the last few miles on tarmac, and it’s not an easy wee course! After I had inhaled up my tea I made my way back to Kirsty’s car to find my dry clothes and sit down and try and stop shivering. Craig called and said he was just coming over the road and I just couldn’t wait to see him for a big hug. He arrived with a flask of coffee in hand – my saviour, and we staggered over to the cafe to try and get some warm soup inside me. My stomach didn’t quite know what it wanted, but anything warm was being appreciated as I sat holding my bowl of soup for a good while before starting to eat it! In the goody bag was a spectacular medal and a bottle of beer which has some of last years Glen Ogle finishers on the label. What a great idea! I don’t drink beer, but I’ll just have it as a keep sake. 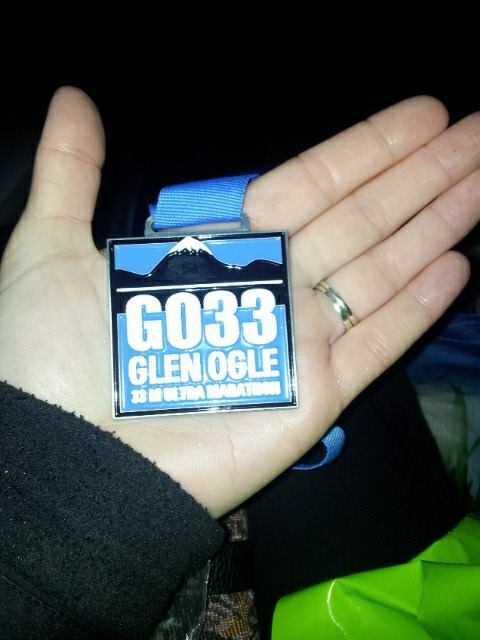 A huge thanks goes to all to all involved in the running and organising of the Glen Ogle 33m Ultra Marathon. I’ll definitely be back next year. With a new jacket. And now what’s next for me? 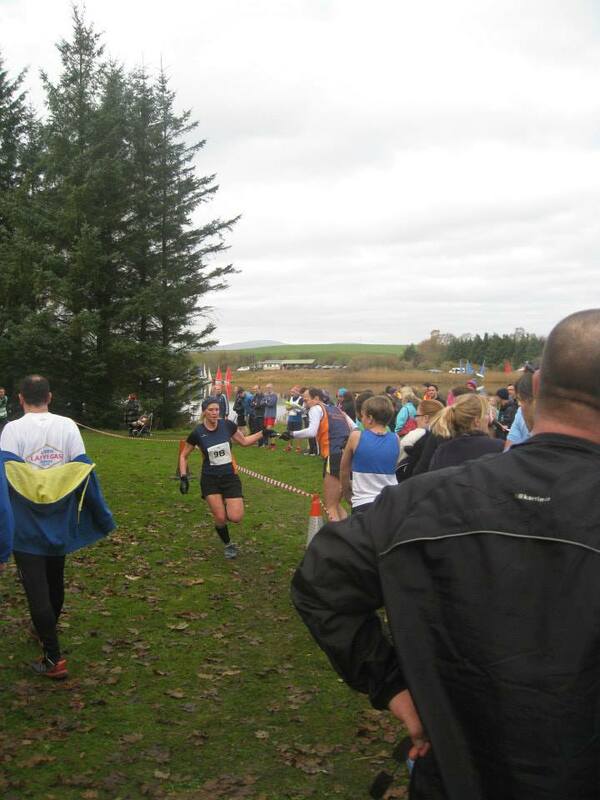 Marathon – tick, 33m Ultra Marathon – tick. I know I have more to give and can go further and be stronger. Next year is a whole new challenge. The very end. Soaked through to the bone, but still found a smile…. Brew dog beer in an awesome bottle.